Great news: I’m officially joining the Moheak family. Beginning next week, my Go Deep new music show will air on Fridays from 1-3p LA time and the music will be just like what you see above. Hope you’ll be able to hang with us! Radiohead–The King of Limbs…I’ll admit I respect Radiohead more than I love them, and I have massive respect for these guys. They’re an easy band to comment on, because everybody already has a set opinion on them. Aside from their entire “Bends” album that I loved, I find myself bonding with several tracks each time out. I tend to go for Radiohead songs with the the biggest grooves, such as “Morning Mr. Magpie”, “Lotus Flower”, and “Little By Little”. This is one band I have yet to see live and absolutely want to. Cut Copy–Zonoscope…This is a fave of mine in this young year. They bring a freshness that combines modern indie dance beats with the 80’s and with the mainstream. When “Where I’m Going” came out late last year, I had hopes that this album might break wide open. While I don’t think that’s the case now that I’ve heard it all, there’s lots to really like. Check out “Need You Now”, “Take Me Over”, and “Blink And You’ll Miss A Revolution”. “Over” is purely commercial as well and adds a 70’s feel to the band’s 80’s influences. “Blink” contains one of the finest grooves I’ve heard in awhile. Speaking of live shows, seeing them on tour should be a must if you like their music. Bright Eyes–The People’s Key…You can include me on the list of those people happy to see Connor Oberst come back to the musical feel of his early Bright Eyes music. People are liking his straightforward approach this time around. The upbeat songs work best for me. “Shell Games” was a perfect track to precede the album, and “Jejune Stars” is just as strong. “Triple Spiral” is another winner. Conner has been making noises that this will be his final Bright Eyes project and we can only hope that isn’t the case. Tom Silverman of Tommy Boy Records has resurrected his two-day New Music Seminars, now being held in both LA and New York over the course of a year. They’re an excellent platform for up and coming artists of all genres to be educated by name panelists. Many aspects of the artist experience are covered. The conference guidebook is packed with helpful info for long-term perusal. Most panelists were high quality. Attendees were told over and over during the two days, that they must engage on all social networking platforms to be most effective. Ian Rogers of Top Spin had great advice we don’t normally hear at a conference. He says artists should NEVER charge for anything until they have over 2,500 fans on their email lists. They should never charge for tracks posted on their websites. Up and coming artists should plan on one small internet event weekly and one major event monthly. The ever-articulate Moby was a fine presence and I couldn’t agree more with his advice: Don’t feel you have to follow the market because the market may well change by the time your music gets out there. Digital media guru Ted Cohen cautioned people not to give up on myspace, which still has good numbers and is quite important in Europe. Among other bits of info, the average age of lead singers on last years top chart songs: 27 years old. 63% of alternative rock artists are interested in signing with a label. That number is expected to drop. A major highlight was live coaching by Tom Jackson of Onstage Success. This super-animated dude critiqued bands who played the night before, then took another band into a public rehearsal for an hour. He showed everybody how he works to build a show. One key point: It isn’t necessary to play the exact studio version of a song if it can be enhanced for greater live effect. Artists played live at night. I was able to be on hand on two of three evenings and my faves were New York band The Little Death. They’re a hard blues-rock band with tremendous energy. Moby was on bass and occasionally on guitar. There’s nobody better at playing uptempo indie-electro music than DJ Paul V. His “Neon Noise” Saturday night mix show crushed it on the legendary Indie 103.1 in Los Angeles. 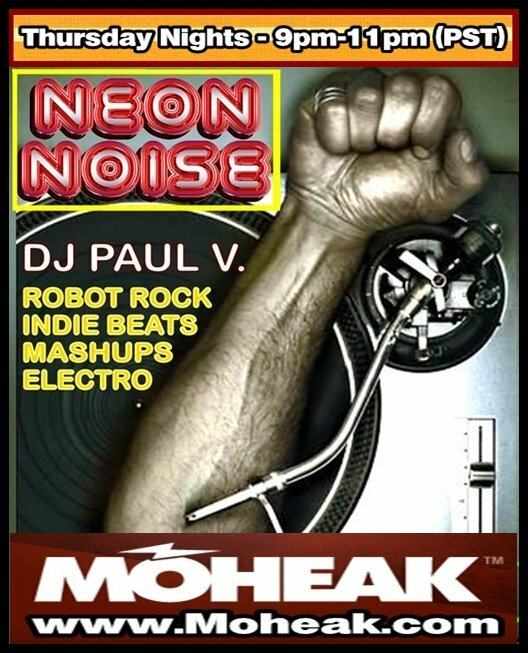 When that station went off the air, Paul was destined to join Moheak.com along with many of the other station stalwarts. He invited me to sit in with him Thursday night. I brought some really cool new faves, and his music was way off the hook as always. You can hear the show by clicking on the streaming link below. If you see this before tonight 7-9 LA time or 10-12 EST, stream it on Moheak when it runs again. Playlist is below. If you like indie-electro, make Paul part of your week. I will be returning to Moheak Wednesday night from 6-7 LA time to do a solo “Go Deep” show so make sure you check it out! MEN ft. Antony Hegarty – Who Am I To Feel So Free? The hard-working Ed Mac of Friendly Fires. Will new direction help or hurt them? 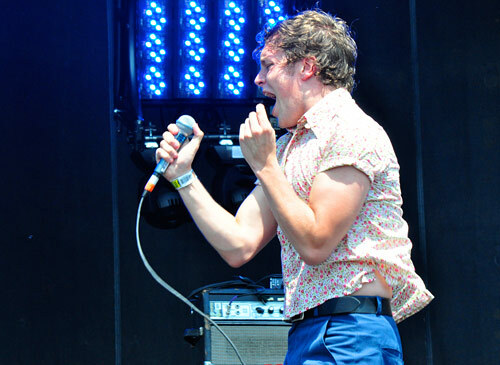 I’ve lately been touting Friendly Fires as the electro band most likely to fully break through if their sophomore album produces a hit or two. They’re on the cusp and easily have one of the top live shows. Their Roxy gig this week was a perfect opportunity for a few hundred of us to check out their new material. I wasn’t ready for what we heard. The 55-minute set consisted mostly of new songs, all of which were more mid-tempo with a funk flavor. Every older song had more energy than any of the new ones. This must be all about getting the band on mainstream radio, and one or two songs have that potential. Growth is good, but I’m surprised they’d risk their sizable fan base with such a drastic change of direction. It’s fairly common, especially in the UK, for bands to overstep reasonable evolution in their efforts to try new things. I’ll wait to hear the new album and I badly want to love it, but I’m disappointed for now. 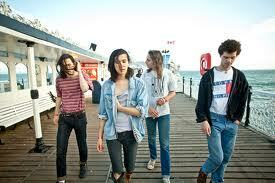 Smith Westerns sold out The Echo Friday night and now we’re talking! Of recent newer band releases over the last few months, their second album has received as much attention as any. Singer Cullen Omori remarked that a year ago, there were 20 people in the same club “so we must be doing something right”. He’s definitely got the front-man goods and comes off surprisingly humble. Every song was a good one and most sounded better live that they did when recorded. While there were a few rough edges, the band delivers onstage and their looks don’t hurt. Lots of hype on this band and it seems to be warranted. Yuck preceded them. If you know Yuck’s easy-going music, that’s very much how they sounded with a bit more feedback thrown in. I just concluded my annual pilgrimage to London where I schedule some meetings and catch some gigs. There were shows, but I’ve already seen White Lies, Duke Spirit and Cage the Elephant. Various Cruelties is a newer band I’ve had my eye on since finding them on blahblahblahscience. “If It Weren’t For You” and “Chemicals” are tracks worth hearing. Perhaps the biggest new band buzz belongs to WU LYF. Every label wants to sign them and while the band now has a publishing deal, they refuse to be signed. What both groups have in common is that neither of them has even established a conventional online presence for themselves. A potential trend? The Various Cruelties website has a design and three song links. They have a half-baked facebook page that didn’t even list an important Thursday night gig until that afternoon. I would have been there but it was too late to change plans. They are accessible enough to have a shot at radio but it’s unknown whether the same goes for WU LYF. Mona is a melodic guitar-oriented band sounding very good to me. The group is actually from Tennesee but the Brits buzz is growing. It’s yet another example of an American band getting its best shot overseas. As with Various Cruelties, I first heard about these guys from Mike at blahblahblahscience. They’re playing Wednesday night at The Echo in LA and I have to determine whether I can see both Friendly Fires and Mona that night when they’re playing in different parts of town. Electro-funk band Fenech-Soler is gaining UK attention. I’m not in love with them yet, but several tastemakers have recommended them to me. Being in England means that I was able to use streaming service Spotify. The Brits feel it’s the best one out there. Spotify had hoped to have launched in the US by now and it finally appears they’re getting close. I was only online enough to scratch the surface, but my initial impression is that the hype is warranted. With companies like Google and Apple probably entering the streaming fray, Spotify needs to get an American leg up asap. 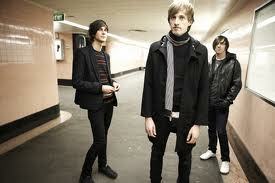 My top 2010 UK story must be the survival of indie rock/indie electro BBC Six Music. The BBC planned to shut them last year but the huge public outcry took network execs aback to the extent where the station is still on the air. Since then, its ratings have maintained a higher level of 1.1 million weekly listeners. It’s nowhere near the 13M+ that hear BBC Radio 1 but this is enough fans to help break a new band. For many years, NME was the weekly mag that had an enormous influence. They’ve tried to widen their appeal during these trying times for print, by writing more about older artists. They sadly seem to have lost their way and readership has remained flat, although their online presence is pretty good. One of my more interesting visits was to the London offices of SoundCloud and mobile app company Mobile Roadie. SoundCloud has expoded from 500,000 to 3 milliion users in the past year. They’ve got some very cool features that I expect to begin using myself. Mobileroadie is creating apps for people as diverse as The Beatles, Iron Maiden and Kylie Minogue. They can provide tools for people to design their own, for as little as $500—a fraction of what it used to cost. 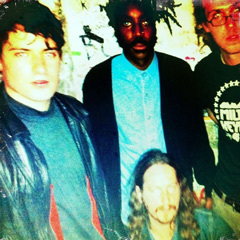 Smith Westerns—Dye It Blonde…The emerging group getting the most 2011 attention so far would be these Chicago guys. They got a nice buzz with their debut, and this second album finds their melodic indie pop more accessible. If I were producing, I would have given the album a heavier sound but the melodies are infectious and single “Weekend” is a killer. Other track tips are “Dance Away” and “End of the Night” . Looking forward to their February 11 show here in LA. Wanda Jackson—The Party Ain’t Over…It seems Jack White nails every project he touches. Here he produces and plays guitar, just a great pairing with 73-year-old rockabilly queen Wanda. The album is all covers, including “Shakin’ All Over”, Ray Charles‘ “Busted”, and Amy Weinhouse’s “You Know that I’m No Good”. Wanda told Conan O’Brien that she used to be a “bad girl” herself, probably having some adventures similar to Amy’s. Check out their Letterman appearance. The Go! Team—Rolling Blackouts…As Spin Magazine wrote, “If the Go! Team didn’t predate chillwave, they would have led the backlash against it.” These bouncy Brits have given us another fun album. It’s not a huge departure from what we’ve heard from them in the past, but it should make their fans happy. Bethany Cosentino (Best Coast) guests on “Buy Nothing Day”. I also like “Secretary Song” and for a change of pace, “Yosemite Theme”. January wasn’t a bad start, but get this: Just this week, you can stream new albums by Cut Copy and Bright Eyes. You can also hear the killer new song by The Kills and Fleet Foxes’ new beauty. RAVE ON! !